A cyclist was killed by a driver on Thursday morning in Long Island City. 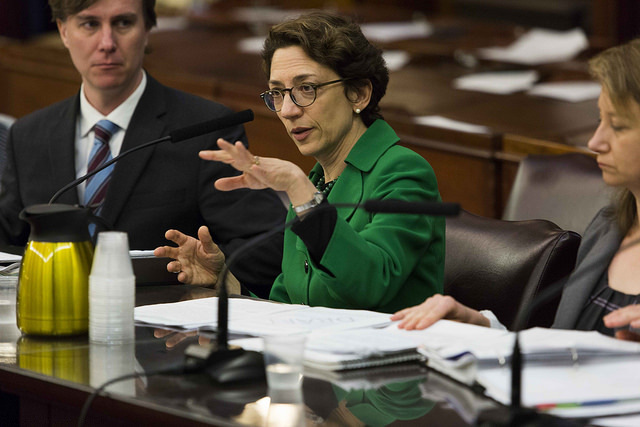 And hours later at City Hall, Department of Transportation Commissioner Polly Trottenberg was saying what she always says. Asked about why it takes so long to build out the protected bike lane network, Trottenberg told Streetsblog reporter Julianne Cuba that money isn’t the issue. The issue is all the work it takes to appease the pro-parking minority. You know who is sick of this kind of talk? 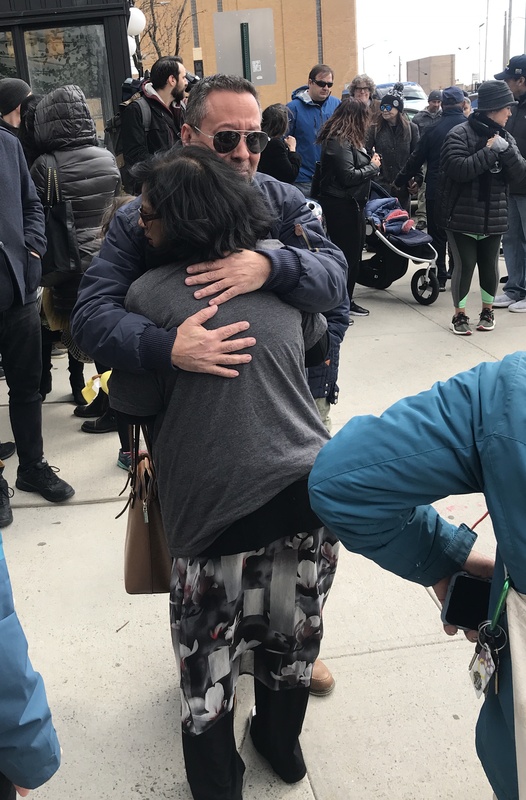 The family of Robert Spencer, the cyclist who was killed Thursday by a driver on an unprotected stretch of Borden Avenue in Long Island City — where residents of a condo building on the block demanded a safety redesign in a letter to DOT in January. 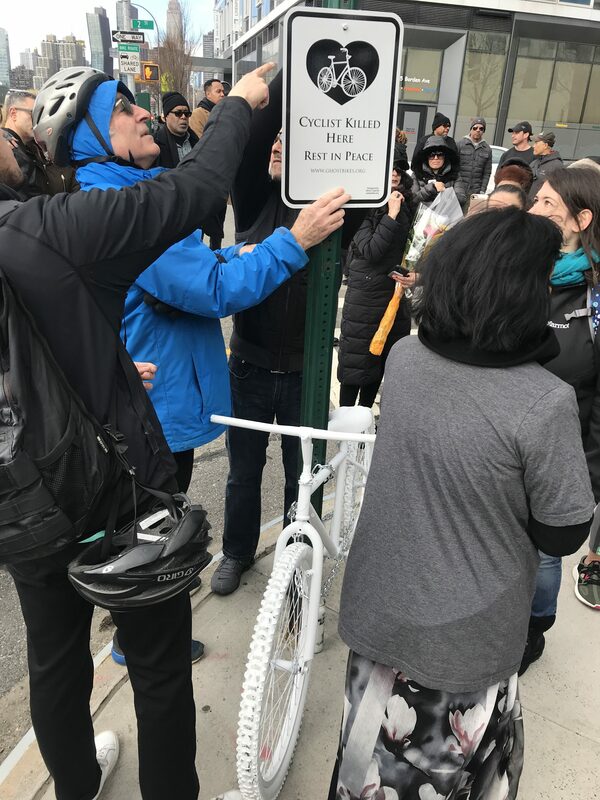 Spencer’s family and cycling advocates gathered on Saturday at the crash site on Borden Avenue and Second Street to mourn his loss — and to berate city officials for not doing more. “When people are dying, that should supersede any bureaucracy getting in the way,” said Spencer, who is known as TJ. 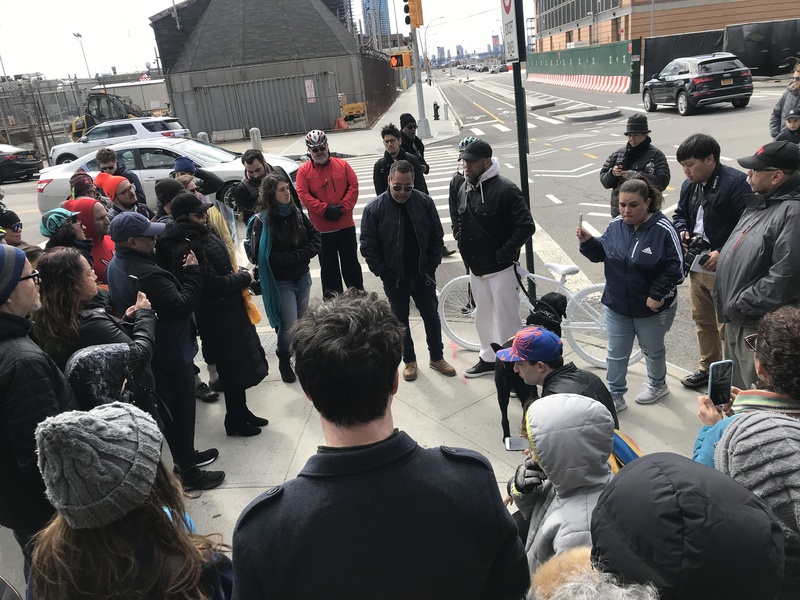 Council Member Jimmy Van Bramer and State Senator Michael Gianaris were on hand at the Transportation Alternatives-organized vigil — but neither of them spoke publicly out of deference to the family. Michael Vega, who was so close to Spencer that he considers himself his brother, made it clear that no political grandstanding would be allowed. Michael Vega, the victim’s friend, is consoled. Vega was frustrated about his friend, but he could have been talking about cyclist Madison Lyden, who was killed on Central Park West over the summer or delivery cyclist Aurilla Lawrence, who was killed last month in Williamsburg. There should be protected bike lanes in both areas, but they are delayed by endless community debates. It’s understandable that Trottenberg seeks community buy-in when she proposes protected bike lanes. And there is value in having city officials go into neighborhoods and present the facts: bike lanes make roadways safer for all users, they boost local business, and they make communities more livable. It’s a great message that DOT has been making for years. And the city has been building protected bike lanes at a rate fasted than during any other prior administration (albeit far fewer last year than the year before). Michael Vega (left) and Gabriel Spencer, the victim’s brother, honored the dead cyclist at the crash site on Saturday. Since then, Council Speaker Corey Johnson has also said the city needs to defer less to community boards when lives are on the line. And there is a council bill that would mandate street redesigns whenever the city tears up a roadway. The bill, Intro 322, already has veto-proof support in the City Council, with 36 Council Members having signed on (Trottenberg opposes the bill). Council Member Jimmy Van Bramer says we need a better system for installing bike lanes. Van Bramer is one of the co-sponsors of the so-called Vision Zero Design Standards bill. And he supports Johnson’s call for streamlining the redesign process so that safety takes precedence over concerns about lost parking spaces or fabricated claims that bike lanes inhibit emergency vehicles. And he backs up what Reynoso said. At the vigil, I reminded Van Bramer that he had in the past been too deferential to community board opinion — but he said he’s seen the light. 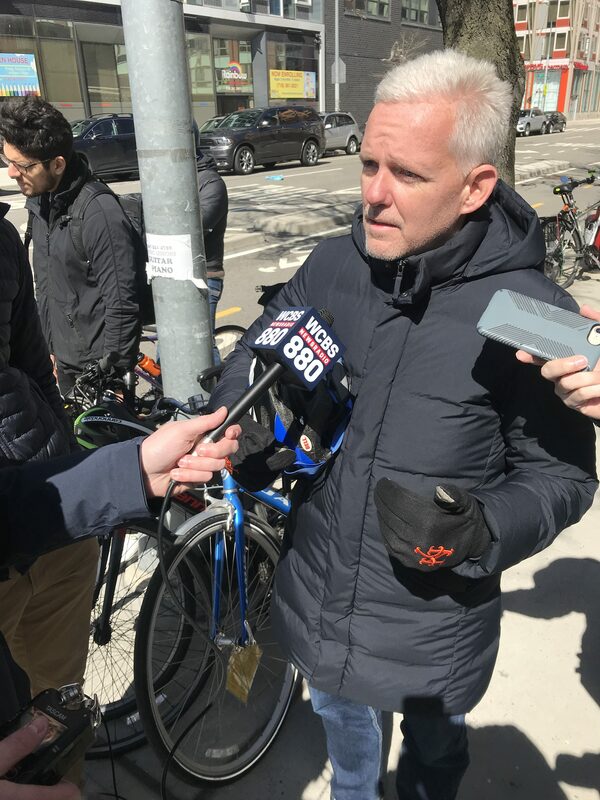 Van Bramer’s own bike ride to the vigil offered the perfect perspective on the city’s failure to keep all road users safe: He had ridden from Sunnyside to Long Island City and found himself without any protection once he left the Skillman Avenue protected lane. “When I got to Skillman and Thomson, I had to battle it out with a cement truck, and that’s horrifying,” he said. “It shows that the process is broken. There are parts of the neighborhood where it is safe…but as soon as you get out of that protected lane, it is not safe at all. It’s widely inconsistent. I’m riding from here to Astoria and I have to ask people what’s the safest way. What we need is every street to be safe and a connected permanent network of bike lanes all over the city in every neighborhood. Trottenberg’s DOT says the same thing after crashes — and said it again after Spencer’s death. “DOT will look into potential safety enhancements at Borden Ave and Second Street, as we do following any fatality,” spokeswoman Alana Morales said. No more deaths. No more community boards. No more deference to people who want to store their cars in the public right of way. Make New York safe. And honor Robert Spencer’s legacy. Your Fired Polly Trottenberg !! Reynoso telling it like it is. Commissioner ‘Prolly Nottenberg’ because it’s just too fitting.